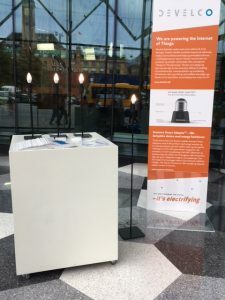 In June and July 2018 Develco is exhibiting an example of development of a product with embedded software as IoT solution for the smart home in the lobby in Industriens Hus. From H.C. Andersens Boulevard in Copenhagen everybody can go in to see the exhibition. For Anyware Solutions Develco has developed the Anyware Smart Adaptor™ with a small print card with many sensors and three microprocessors placed between the inner and outer threads in the socket. An E14 LED bulb is screwed into the adaptor to be mounted into an E27 lamp socket. The adapter is to be installed via Anyware App™ on the cell phone, where the adapter is connected to Bluetooth of the cell phone and to WiFi with its own address, and the consumer can control the adapter worldwide. The adapter measures temperature, humidity, sound and light and functions as a dimmer. It can help preventing intrusion and monitoring the indoor climate in your home. All data from the sensors in the invisible and elegant adaptor are sent to the Cloud. In the special edition of the magazine Ingeniøren about IIoT on 1st June 2018 Develco has an advertorial about development of the Anyware Smart Adaptor™ with more details about the adaptor. Develco is an expert in developping products based on electronics, wireless communication technology and embedded software. In the development process Develco cooperates with the customer about the product and works systematically according to the principles “Design for Manufacturing”. Develco can take the full responsibility from the innovative idea phase to the product concept phase, the mass production and the packaging. Extensive knowledge and experience with wireless technologies makes Develco an expert and a preferred business partner within IoT. If your company has a product idea which you want to realize, Develco is always ready to a preliminary meeting about the development of new products and components which function, have market potential and are designed for manufacturing.